An update on the TBH: It's been 4 weeks since Marty came to pick up the hive. 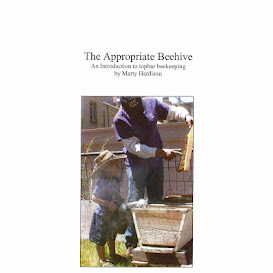 It was 14°F that morning, yet those crazy survivor bees, they were hanging out on the landing board watching it snow. I had a piece of screen set aside for their road trip, but I hadn't told BB about it; Marty wasn't supposed to come 'til the next day. Anyway, Marty found some floating row cover I'd left in the greenhouse and stuffed some in the entrance. After an uneventful drive, he placed the TBH at his home and pulled the Reemay out. Unknown to him, a small piece of the cloth tore off inside the hive. The little TBH was packed full of bees, ready to split; before long their respiration soaked the little piece of Reemay and, freakin' freak storm, froze the entrance shut. In years past, I've used a special top bar for upper ventilation, but I hadn't given it to these bees. Did you feel the great disturbance in the Force? Marty feels so bad about it. He showed up at my house with gifts of honey and beeswax, and tears welling up. He started down the path of if-onlys, but I told him let's just move forward. No sense dwelling on the loss. Turns out he'd already restocked the hive with a package headed by a Carniolan queen. At first I was flipped out, but then I realized the best way to clean out a deadout, is with bees. The nice straight combs in the TBH are a valuable resource not to be wasted. Besides, Carniolan is the race we'd originally chosen, as they tend to overwinter with smaller clusters, so the new bees are perfect for the little hive. He says they're doing well. He calls them "your bees," when he emails us. So that's the scoop on the TBH. Hang on for an update on the Warré hive… the video is in post-production. And just because I never publish a post without a picture, here you go. 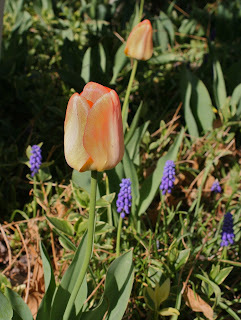 These are my favorite tulips. They start off clear yellow and day-by-day, turn apricot-orange. I've never seen a honeybee inside a tulip but they make a nice companion to the grape hyacinths, which the bees do like. So did the blocked entrance kill the bees? I would be interested to why you felt the bees did die. By the way what is “Floating row Cover”? We don’t get that in New Zealand. Looking forward to the video of Warre Hive. Yes, @Gary Fawcett they suffocated because of the blocked entrance.